Global warming of 2°C, the higher of the two Paris targets, would see current record-breaking temperatures become the norm in the future, potentially bringing heatwaves to both land and sea. Australia is a land of extremes. We’ve experienced all manner of climate extremes over the past few years, from heatwaves (both on land and over the Great Barrier Reef), to droughts and flooding rains. We can already link some of these recent extreme events to climate change. But for others, the link is less clear. So far we have had about 1°C of global warming above the average pre-industrial climate. So how will extreme weather events change with more warming in the future? Will they become more frequent? Will they become more severe? We have investigated these questions in our new research, published today in Nature Climate Change. It is vital that we understand how climate extremes in Australia might change if we limit global warming to either 1.5°C or 2°C, and what the implications might be of pursuing the more lenient target rather than the more ambitious one. In our study we used state-of-the-art climate model simulations to examine the changing likelihood of different climate extremes under four different scenarios: a natural world without any human-caused climate change; the world of today; a 1.5°C warmer world; and a 2°C warmer one. First, we looked at hot Australian summers, like the record-breaking “angry summer” of 2012-13. We already knew that human influences on the climate had increased the likelihood of hot summers. Our results show that this trend would continue with future warming. In fact, in a world of 2°C global warming, even an average summer would outstrip those historically hot ones like 2012-13. Australian summer temperatures are strongly related to the El Niño-Southern Oscillation, with hot summers more likely to occur during El Niño events, and cooler ones during La Niña episodes. In the past, a summer as hot as 2012-13 would have been very unlikely during a La Niña. But our modelling predicts that with either 1.5°C or 2°C of global warming, we could expect similarly angry summers to occur during both El Niño and La Niña periods. We already know that the sea surface temperatures associated with mass bleaching of much of the Great Barrier Reef in early 2016 would have been virtually impossible without climate change. If the world continues to warm to either the 1.5°C or 2°C levels, very warm seas like we saw early last year would become the norm. 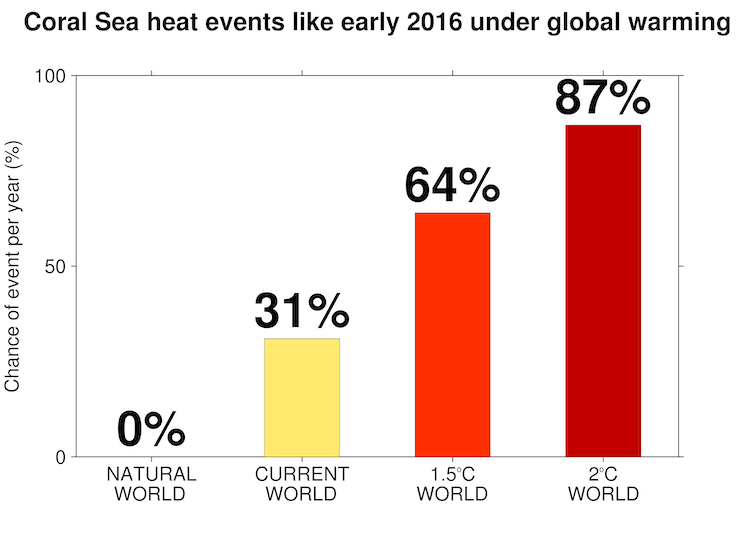 In fact, our research suggests that with 2°C of global warming, the future average sea temperatures around the Great Barrier Reef would be even hotter than the extremes observed around the time of the 2016 bleaching. 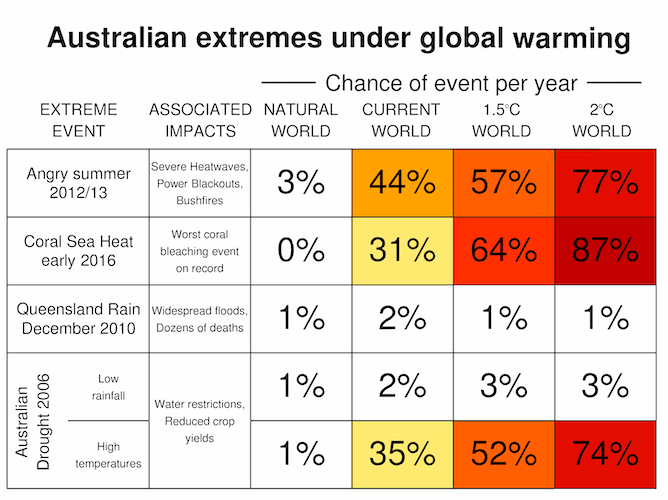 With either 1.5°C or 2°C global warming, we will see more extremely hot summers across Australia, more frequent marine heatwaves of the kind that can cause bleaching of the Great Barrier Reef, and probably more frequent drought conditions too. In December 2010 Queensland was devastated by severe flooding following very heavy rainfall. Our analysis suggests that this kind of event is highly unusual, and may well continue to be so. There isn’t a clear signal for an increase or decrease in those events with ongoing climate warming. Natural climate variability seems to play a greater role than human-driven climate change (at least below the 2°C threshold) when it comes to influencing Australian heavy rainfall events. The Millennium Drought across southeast Australia led to water shortages and crop failures. Drought is primarily driven by a lack of rainfall, but warmer temperatures can exacerbate drought impacts by increasing evaporation. Our results showed that climate change is increasing the likelihood of hot and dry years like we saw in 2006 across southeast Australia. At 1.5°C and 2°C of global warming these events would probably be more frequent than they are in today’s world. It is clear that Australia is going to suffer from more frequent and more intense climate extremes as the world warms towards (and very likely beyond) the levels described in the Paris Agreement. If we miss these targets, the warming will continue and the extremes we experience in Australia are going to be even worse. The more warming we experience, the worse the impacts will be. The solution is clear. To limit global warming, the world’s nations need to reduce their greenhouse gas emissions – fast. Andrew King is Climate Extremes Research Fellow, University of Melbourne; Ben Henley is Research Fellow in Climate and Water Resources, University of Melbourne, and David Karoly is Professor of Atmospheric Science, University of Melbourne. This article was originally published on The Conversation.